I am doing well, almost six weeks after my mild heart attack. Yes -- I have gotten health religion! I have cut out red meat from my diet, have drastically cut down the cholesterol and sodium in my diet, have cut out most of my unhealthy snacking, and have been exercising regularly. My blood pressure is down, and although I have not seen the most recent blood work results, I know my cholesterol should be way down. I have lost 18 pounds and feel great. It was unfortunate that my wake up call was what it was, but hopefully I will not have any of those issues in the future. A few weeks ago I met with the president and a board member from my homeowners' association. I did get an apology for the way in which my situation was handled (letter from attorney without any prior notice from the association), although the president did think my wife's straw garden was nasty looking. As soon as the final harvesting is done we will break down the bales for compost, which was our original plan. As for my neighbors who didn't like it -- screw them! Oh yeah -- our annual association meeting was last night. Only four of the board members attended (a few were out of town) and only four home owners showed. I nominated myself for the board prior to the meeting, but a quorem was not present and therefore no voting took place. Am I on? Not sure. Better to keep your enemies close. I decided against playing in the stimulus event at the WSOP Circuit Event at Harrah's Horseshoe Hammond because I didn't want to deal with the hassles. I played once at the riverboat in Peoria (lost once again there) and finally had a home game on my table. I hope to return to The Shoe sometime in the next two weekends and have a home game scheduled for one week from today. I am ready to go to Las Vegas in December for the annual blogger gathering and tournament. I get the impression that the government's heavy hand with online poker will have a big effect on attendance this year. It seems to me that a lot of the old "A list" bloggers plan on going but not so many of the B and C listers. I also have a return trip to Las Vegas already planned for February and may also be going to a professional conference in Clearwater Beach, FL that same month. Sounds interesting. The Fighting Illini play against the bad guys from THE Ohio State Cheativersity on Saturday. The Illini are 6-0 and hope to extend their dream season with a big victory. No Jim Tressel, no lies, no memorabilia sales. Does THE Ohio State Cheativersity have anything else? I hope not. Go Illini! Things have been going exceptionally well since I got my wake up call. I made some radical changes in my diet, have been doing lots of walking and cardio work, and as a result, feel great! I have lost 15 pounds and have already crossed that bridge where exercise feels good and I look forward to it every day. I am kind of surprised that I have not really missed all the food I cut out. I guess that fearing you will croak combined with watching your weight keep heading down will do that to you. I still have not eaten red meat in over a month, have not had pizza or Chinese food or some of the other things that were staples of my old diet. Life has been good, and I am thankful. I went to a river boat to play some poker last weekend and did not do well. Among other things, my pocket Queens were cracked by someone who played a one-gapper and flopped a straight. Yuck. I had my first home game since last December on Wednesday evening. Small group, but I was still able to turn a tidy profit. It was good to host again after a massive basement clean up effort. I was tentatively planning to play in the WSOP Circuit -- No Limit Hold 'em Stimulus tournament on Wednesday, October 19 at Horseshoe Hammond, but I am not sure about all the logistics with the drive up there, registration for what might be a massive field, and work. I will update when I decide what I am doing. I may have the moves like Jagger, but I would rather have the run-good that Josie has in tournaments. I wish I could say that I had a nice, deep run in my WSOP Circuit tournament last Wednesday, but that would be far from the truth. My 7,000 starting chip stack only got me about six levels of tournament play. Ugh. Playing in a 50 and over tournament is actually a fun experience. Nobody feels like they have anything to prove, the play is usually solid and polite, and the humor is of a different type. Where else could you hear comments like "At least we don't have to put up with any guys wearing a hoodie and sunglasses" and "One guy had an iPod too and couldn't even hear the dealer say anything." He he. At my table, a guy in seat eight had trouble seeing the cards so our first dealer read him each flop. My table did not have an auto shuffler and the first dealer was excruciatingly slow, so play was very slow. I got crappy cards and did not even see a flop (I was forced to fold my blinds) until the second thirty-minute level when I got pocket Kings in middle position. I made a healthy raise and was surprised to see that I got four callers, seeing as how I had not even played one hand yet. The flop contained three uncoordinated low cards, so I thought I was in fine shape. I made a big raise and only got one caller -- the eight seat who had checked the flop. The turn was a blank, eight seat checked, and I bet. He called. Hmmm. The river was another blank and this time the villain went all in. I'd now already lost almost half my stack. My gut was telling me that he hit a set on the flop. I either had to fold or risk my tournament that my pair of Kings was good. I folded, bringing a few gasps from the table. After about a minute the villain said "If you folded pocket Kings or Aces you made one hell of a fold." Yes -- the gut was right, but now I was the table shorty. I survived playing uber-tight and stealing a pot or two as the table got more aggressive, my crap cards continued, and eventually antes kicked in. I pushed with A-9 and was called by another shorty with 7-7. An Ace on the flop doubled me up and kept me in the game for a while. As my stack was getting very low I decided, after some thought, to call a shorty's push with A-9. He had A-10 and hit trips on the flop, so the drama and my tournament were both over. Talk about ugly -- only two good hands in about six levels of tournament play. Play at the this poker room was as I remembered from my last trip -- fun and beatable, although I was card dead my first session and lost a little bit. The second session I was at a table where I believe that I was the only non-local. Now I have to tell you, the locals at this casino all seemed to be very friendly with each other and buddy-buddy with several of the dealers, which made things a tad uncomfortable. I was able to build a decent chip stack but got really pissed when one of the locals, a guy named Jamal, shot an angle. I was dealt pocket Queens and raised, only to be re-raised by Jamal. I remembered him from my last trip and my take on him was that he was pretty tight and a solid player. I was putting him on Big Slick. I called. The flop was King-rag-rag. I thought I was in big trouble. I checked and Jamal made a smallish raise and I insta-called. I checked the turn and he checked behind. Hmmm. The river was a blank and I threw out three redbirds to see what he would do. He then threw in three GREEN chips and said "Oops -- I threw in the wrong ones." Like I am some freaking moron. I looked at him and said "I don't believe you for one second" and angrily chucked my cards in the muck. A-hole. 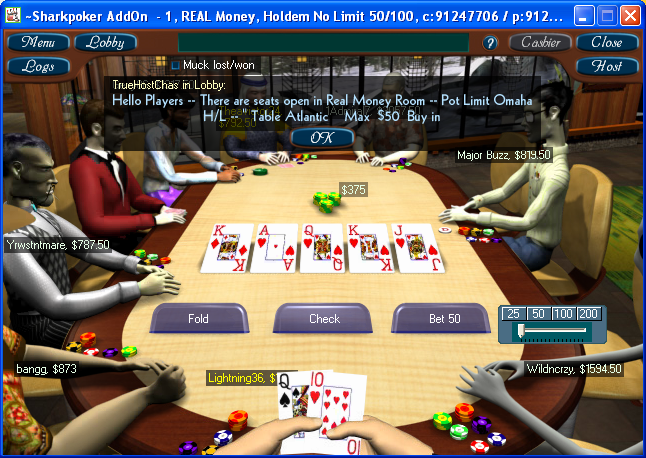 Some wild players came to the table and were virtually giving away chips. Unfortunately, my wins were nullified when my pocket Aces were cracked twice -- to quad Kings and flopped two pair. Ugh. Later toward the morning (my session went from about 7pm until 8:30am) some aggressive inexperienced players came to the table, but I was never able to get into their stacks. I left with a decent profit and decided to get some sleep. I hoped to get in one last session, and what a beauty it was. The deck smacked me for a bit and I was able to take full advantage of it. I made a huge score when I flopped a set of 4's with an Ace on the flop. I thought I was ahead all the way and did not know if an Ace on the river might have screwed me. I re-raised the villain's final raise, and he tanked before calling, telling me that I won the big hand. I was shocked to see that he had flopped a straight and was ahead of me the whole time. Thank goodness for the river or I would have lost a buy-in. As usual, a tournament was disappointing but the cash games were great. This does not surprise me as my history shows that I am much better at cash games then large tournaments. Smallish tournaments seem to work for me, but geez -- could I catch a break or two when I play the big ones? Next up -- the WSOP Circuit Event at my "home" poker room -- Harrah's Horseshoe Hammond. I plan on playing in the October 19 NL Hold 'em Stimulus tournament. It would be nice if thing went a little better at The Shoe. Greetings from Harrah's (Horseshoe) Southern Indiana, which is across the Ohio River from Louisville, KY. I am spending a few days here to relax and play some poker. In 90 minutes (3:00pm Eastern) I will be playing in the WSOP Circuit Event -- 50 and over tournament. I will be updating my progress on twitter (@lightning36), going on the assumption that I don't donk out in the first hour or so. I do not think the crowd for this tourney will be big. Not many had entered at the time I entered two hours ago. The trip down here yesterday was nice. Of course, trips now have to fit in with my new realities -- like eating heart healthy. This didn't seem too bad on the way down as I stopped at Subway for a sandwich -- not with all the fatty and sodium-laced meats and extras, of courses. I even stopped at Meijer to get myself some fresh fruit and vegetables for snacking. They ended up becoming my late late dinner last night. I played some $1/2 NL cash games last night. I was card dead for hours, which is always very frustrating. I was never up nor down very much and ended up dropping a little bit. Lunch today was at the Paula Deen Buffet. Now THAT was a trip. Fried catfish, fried green tomatoes, fried shrimp, fried ... Needless to say that the picking were a tad slim for me. I definitely need to request that they include at least a few heart healthy things in the future. I am sure there must be at least a few others who are carefully watching what they eat. I had a new experience today as I actually used the exercise room of a hotel for the first time. The trip was in place of my regularly scheduled cardiac rehab hour on Wednesdays. This exercising is actually starting to feel pretty good. I feel rusty tournament-wise, so I hope to channel my inner Josie (sorry -- no link) and blast away. Yowsa!